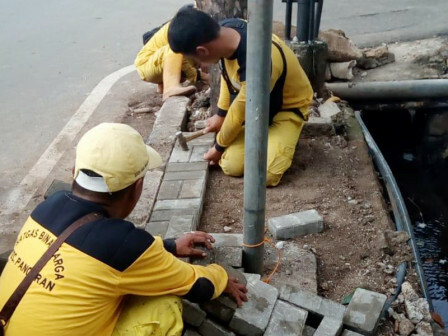 For the sake of mutual convenience, Pancoran Sub-district Bina Marga officers are arranging a sidewalk and a waterway alongside Jalan Warung Buncit Raya.
" It is aimed to minimize puddles when rain pours"
"It is aimed to minimize puddles when rain pours," said Pancoran Sub-district Bina Marga Executing Unit Head, Zainuri, Friday (1/11). It has been carried out since yesterday. "We clean them (sidewalk and waterway) up to seven meters long and two meters widt h," he said.